Sorry I have not posted in a bit. I've been busy training to climb Mount Whitney next week (I have a permit to climb the tallest mountain in California on Tuesday, July 29), so I've been spending a good deal of my free time at the gym and fitting in weekend climbs in the San Gabriels. But I have covered a few shows for the Orange County Register this month, including a strong bill with Chris Isaak and Vanessa Carlton on July 13, and a reggae show headlined by the Wailers on July 17. There was a time – say 10 years or so ago – when singer-songwriter Chris Isaak seemed destined to be forever identified solely with his best-known hit, the haunting and timeless "Wicked Game" off 1989's breakout recording "Heart Shaped World." However, when an entertainer has the musical instincts, a captivating Roy Orbison-styled vocal style and a top-notch five-man band, it might not matter if he ever had a single hit on commercial radio for a near-capacity crowd to enjoy the best ride of the day at the Orange County Fair thanks to his two-dozen song set on Sunday (July 13, 2008). Isaak may not be the most innovative artist of all time – in fact, the personable singer-songwriter covered tunes from several of his 1950s era heroes over the course of his 95-minute set – but his retro-tinged rock 'n' roll is much more than a bland nostalgic act. While the haunting "Wicked Game" may be his masterpiece, several new songs set for release on his next album achieved nearly equal power in the live setting. In particular, one song ("We Let Her Down") was particularly strong, with its sparse and moody delivery enhanced by lead guitarist Hershel Yatovitz echo-drenched guitar work. Isaak was so much in control of the crowd, he could alternate between raucous rockers such as a cover of "I Want You to Want Me" and his own "Baby Did a Bad Bad Thing" and hushed acoustic titles like "Dark Moon" and "Two Hearts" while keeping the momentum going strong. Isaak closed his full-length show with a poignant, acoustic version of "Forever Blue," a fitting finale to the best show this writer has caught by Isaak. Opener Vanessa Carlton was anchored to her piano throughout her 45-minute set, but that didn't prevent the Pennsylvania native from playing her accessible material in an entertaining nine-song showcase. The best songs in her Sunday set came off her third album, 2007's "Heroes & Thieves," which find Carlton exploring deeper issues than her better-known 2002 debut "Be Not Nobody." Whether singing about being dropped from her first record label in "Nolita Fairytale," the joys of an exciting romance in the wonderful "Hands on Me" and a magical walk through New York's Central Park chronicled in "Heroes & Thieves," her fine piano playing and vulnerable voice (often cracking artfully at its upper range) made for a particularly good outing. Because the Wailers are rightfully identified with some of the biggest and most significant reggae recordings of all time, fans of the genre are justified in making it to at least one of the band's shows. And while singer-songwriter Bob Marley died in 1981, several longtime members of the Wailers (notably bassist Aston "Family Man" Barrett) continue to play as part of the ensemble, which was fronted this evening by the singer Yvad. In a 90-minute set before a near-capacity crowd at the Pacific Amphitheatre on Thursday night (July 17, 2008), the Wailers proved that good songs are timeless and classics such as "No Woman No Cry," "Is This Love," "One Love" and inspired night-ending "Exodus" continue to shine when played with the kind of magic put on display under a bright full moon in Costa Mesa. Although the group's first few songs were not played with quite enough firepower, the group hit its stride when it turned the outdoor venue into a giant dance floor with a feel good-styled "Keep on Movin'" and "Stir It Up." A strong vocal performance highlighted "I Shot the Sheriff" minutes later and that set the strong tone for the rest of the night. The Wailers seem to have a few new tricks up their sonic sleeve, with Yvad kicking off the encore with an acoustic guitar and playing the folk-styled "Buffalo Country" that could have been at home in a Neil Young set. Eek-A-Mouse might be the talent that launched a well-known vocal style (sing-jay, where a singer uses vocals to fuse singing and DJ-styled chant together), but the Kingston, Jamaica, native's 35-minute lackluster set seemed at odds with the ready-to-cut-loose crowd that greeted his initial arrival. Ultimately, Eek-A-Mouse's performance was a backdrop to everything else happening in the crowd (more on that a bit later). Had he simply performed "Biddy Biddy Beng" or "Sensee Party" over and over, he would have been greeted with the same cheers. Although many in the crowd had not yet arrived when Pato Banton kicked off the night with his own 35-minute set of original music, the Birmingham, England, singer actually accomplished something the night's subsequent acts did not. Armed with his engaging personality and an extended walk through the crowd early in his set, he had the party-minded audience actually listening to his songs. Songs such as "Stay Positive" and "Don't Sniff Coke" hit home with his emotive vocals and strong performances from the seven members of the Mystic Roots Band and two backup singers. On another note, anyone interested in enjoying the show solely for music-related reasons would have been disappointed. From the time Eek-A-Mouse took the stage, many in the crowd were more interested in snapping photos with their friends, talking on their cell phones, hitting beach balls and – this was a reggae show after all – smoking and drinking to the point where at least one concert-goer was so sick in the row in front of me he had to be escorted out before the Wailers even hit the stage. 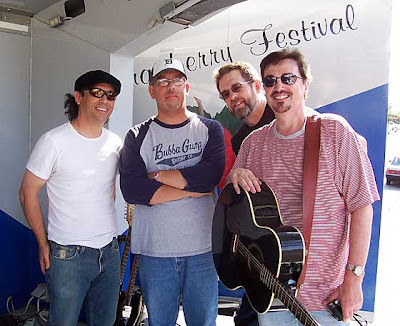 The Barry Holdship Four will play at the Orange County Fair on Sunday, July 13. If there is a style of music ideally suited for the long, warm days of summer, it is power pop. Now fans of jangly pop-rock and lush vocal harmonies will have a number of opportunities to catch regional proponents of Rickenbacker-powered sounds thanks to a trio of shows coming to the Orange County Fair. Time Warner Cable is sponsoring entertainment on the Plaza Arts Stage at the fairgrounds throughout the event, but has specifically set aside three Sundays to host mini-music festivals. "The Damage Done and I are excited and honored to be a part of this year's Orange County Fair," said Courtney Chambers, who inaugurates the bill on July 13 with a 10:30 a.m. set. "We're looking forward to kicking off the show and unveiling some new songs in our live set." Orange County's music scene will be represented throughout a series of concerts sponsored by Time Warner Cable. Courtney Chambers & the Damage Done, Sparkle*Jets UK, Kenny Howes, Walter Clevenger & the Dairy Kings and the Barry Holdship Four will perform on July 13, while a so-called "Night After Prom" event will feature students from the Commercial Recording Arts Department at Huntington Beach High School performing songs from the Beatles' "Rubber Soul" and the Beach Boys' "Pet Sounds" as well as original material from 11 a.m.-noon and 1-2:30 p.m. on July 20. The series of special concerts ends when the Orange County Fair hosts International Pop Overthrow (better known as "IPO") for a day, with 10 bands set to perform between 10:30 a.m. and 3:30 p.m. on Aug. 3. That lineup features several regional acts such as Orange County's X86, as well as artists from around the world (including Japan's Strawberry Mud Pie and Canada's the Irises). "I suggested to David Bash that we hold an IPO show at the Orange County Fair," said John Borack, who has been assisting IPO founder David Bash organize events in Orange County since the annual pop festival was launched in 1998. "This is the second year that we (Time Warner Cable) have been a sponsor of that stage. Last year, I noticed the stage was empty sometimes during the day. I thought, I know a lot of bands and people in bands. I checked with the people we deal with at the fair and they were excited by it. "It's a whole untapped audience that otherwise might not hear this music." So while Borack has been busy organizing the trio of concerts at the Orange County Fair, the Fountain Valley resident will take a break from organizing concerts so he can play in some too. He will play drums with the Barry Holdship Four at the fair on July 13 and at the Fountain Valley Summer Concert Series from 6-8 p.m. on July 17; he will also get behind the kit with the Popdudes as part of an IPO date at Fitzgerald's in Huntington Beach on July 26. In addition, Borack is busy planning to pen a follow-up to his "Shake Some Action: The Ultimate Power Pop Guide" that was published by Not Lame Recording Company in late 2007. The ambitious and fully-illustrated book has sold several thousand copies and a follow-up is already in the works. "I have been playing with Barry (Holdship) for more than two years and had never recorded with him. (I thought) it would be great to do something and it be exclusive for the CD recording that accompanies the next book," Borack explained. Earlier this year, the Barry Holdship Four went into Clevenger's studio to record a version of Elvis Presley's "Girl Happy." An early mix of that recording can be heard at www.myspace.com/barryholdship. Borack said the real treat for music lovers is to see power pop acts in a festive live setting such as the Orange County Fair on Sunday afternoon. "I think it will be a real treat for fairgoers. The music appeals to kids who like Green Day and to their parents and grandparents who grew up and listened to the Beatles. The bands booked to play at the fair represent a wide range (of styles) that people will like," Borack said. For general information about the Orange County Fair, visit www.ocfair.com. For more specific information on any of the events, email Borack at Popdude@aol.com. One of the most popular groups to ever perform as part of the Music at the Library concert series will make a much-anticipated return to San Juan Capistrano with two performances this weekend. Laurel Canyon Ramblers will bring an intoxicating blend of bluegrass, folk, country-western and Americana styles to the upcoming shows at San Juan Capistrano Regional Library. Led by Herb Pedersen (vocals, banjo, guitar), Laurel Canyon Ramblers’ strong lineup also features Kenny Blackwell (vocals, mandolin), Richard Reed (vocals, guitar), Bill Bryson (bass) and Gabe Witcher (fiddle). The ensemble has released a trio of winning albums, including “Rambler’s Blues” (1995), “Blue Rambler 2” (1996) and “Back on the Streets Again” (1998). Catching Laurel Canyon Ramblers in such an intimate setting as the outdoor courtyard at the San Juan Capistrano Regional Library is a treat for fans of progressive country music. Pedersen has been a key member of seminal groups such as the Desert Rose Band and his singing and banjo playing with the Dillards and Country Gazette is recalled with his work with Laurel Canyon Ramblers. Laurel Canyon Ramblers will perform at the San Juan Capistrano Regional Library, 31495 El Camino Real, San Juan Capistrano, at 6:30 and 8:30 p.m. Saturday, July 5, 2008. Tickets for the show are $ 1 0 for adults, $5 for children under 1 2. For more information: www.musicatthelibrary.com.